This quick sandwich can be made with a panini press. Equally delicious if you choose to omit the turkey. Preheat the panini press or grill. Spread the honey mustard evenly over each slice of bread. Layer apple slices, cheese, and turkey over four slices of the bread. Top each with the remaining bread slices. Lightly coat the press or grill with vegetable cooking spray. 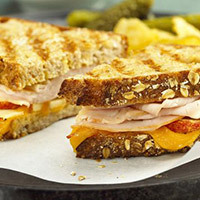 Grill each sandwich for approximately 3 to 5 minutes or until bread is golden brown and cheese has melted. Remove from pan and cut in half. Serve with a green salad for a quick lunch or dinner.